The first Think Outside event for 2015 saw a fascinating presentation of design thinking in action with the topic of Repair under discussion by esteemed design minds – Dr Grace McQuilten, founder of The Social Studio; Bec Barnett and Tristan Schultz of Redirective Practice; with architect and urban designer Peter Edwards moderating the evening’s proceedings. 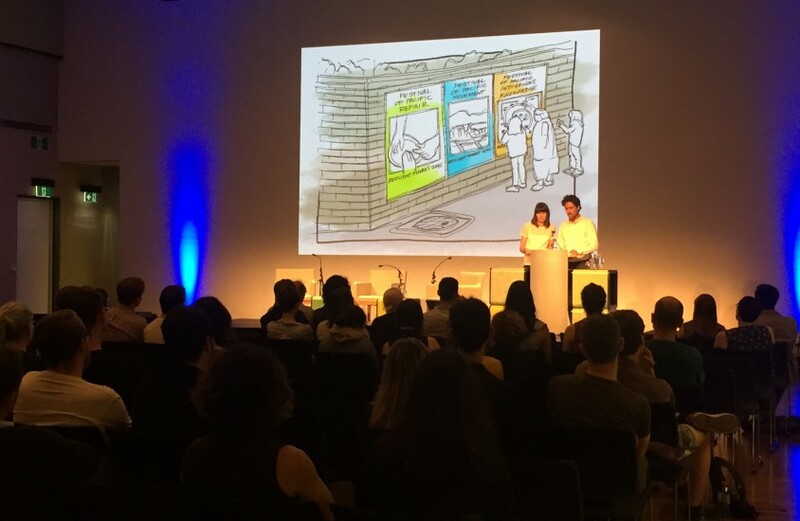 Bec Barnett and Tristan Schultz were first up to the microphone to explain how they would tackle the Repair topic from the perspective of their design practice – using their skills to change people’s behaviours and attitudes in recognition of the future challenges yet to be faced. They approached the theme of Repair from a position of using design to heal tensions preferably before it escalated and said they employed cognitive redirective mapping to fully understand the precursors to conflict. Bec and Tristan developed two design narratives around the Repair topic – the issue of climate refugees in the Solomon Islands and food security in drought-affected North Queensland. They described in detail the process by which they would map the causality of the issues (e.g. from historical colonisation), mapping the present realities, and mapping out alternative futures. ‘This isn’t a utopia…we can’t design these things away, it’s not magical in that regard but we can design ways to get around them to adapt to those challenges and to mitigate those challenges and redirect them,” said Tristan. As part of their presentation, Bec and Tristan put forward two design fictions which proposed a different future where the issues had been addressed with culturally sensitive and appropriate strategies. Next, Grace McQuilten commenced her presentation with a brief discussion of design and how it has evolved from merely beautifying the world as seen in the Bauhaus School movement of the early 20th Century to the contemporary view of design today where it has become a dominant presence in our human experience. Grace explained how design affects our everyday lives and said design has been reconfigured from the material to the social – it affects on our relationships with others and our life choices. She described social projects which allowed people to gather together in a space to maintain a connection to culture, maintain a sense of belonging, or encourage debate and discussion. Grace also explained The Social Studio model and the ethos behind it saying it was to transform the power structures in design to be more inclusive of those who may not conform to the conventional career path of the Australian designer. She said the studio was a means to changing public perception and to create real outcomes, in terms of income generation, for those who come from different cultural backgrounds or are refugees. Following Grace’s insightful presentation, Peter Edwards facilitated a panel discussion and questions were taken from the audience to further explore the role of repair in design. This article was based on the ‘Think Outside: Repair event held at the State Library on Wednesday 30 September 2015. How might design intervene in points of tension before they escalate? How might design counteract the ongoing social, environmental and psychological impacts of conflict.